February 24, 2016 - For the past nine years veteran automotive journalists have donated their time to act as judges in the only annual North American truck competition that tests pickup and van models head to head – while hauling payload and also towing. The Canadian Truck King Challenge started in 2006, and each year these writers return because they believe in this straightforward approach to testing and they know their readers want the results it creates. I started it (and continue to do it) for the same reason – that and my belief that after 40 years of putting trucks to work I know what’s important to Canadians. Now, that’s a long list of qualifications, but in a nutshell it’s the concept that a truck can be pretty, but that alone is just not enough – it also better do its job – and do it well. 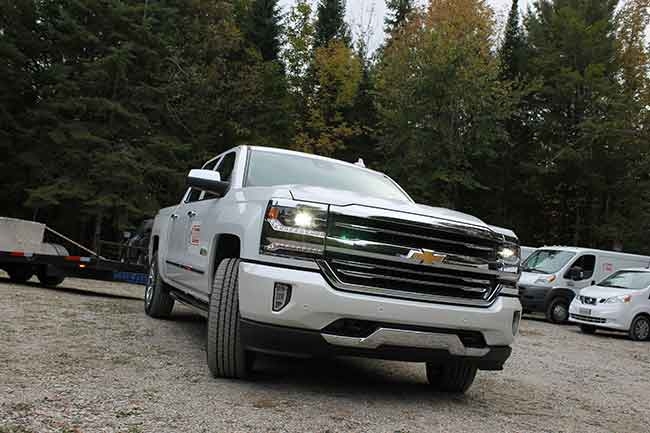 This year, nine judges travelled from Quebec, Saskatchewan and across Ontario to the Kawartha Lakes Region where we test the trucks each year. All the entries are delivered to my 70-acre IronWood test site days before the judges arrive so we can prepare them for hauling and towing. In the meantime they are all outfitted with digital data collectors. These gadgets plug into the USB readers on each vehicle and transmit fuel consumption data to a company in Kitchener, Ont. (MyCarma) who records, compiles and translates those readings into fuel economy results that span the almost 4,000 test kilometers that we accumulate over two long days. These results are as real world as it gets. The numbers are broken into empty runs, loaded results and even consumption while towing. Each segment is measured during test loops with the trucks being driven by five judges – one after the other. That’s five different driving styles, acceleration, braking and idling (we don’t shut the engines down during seat changes). The Head River test loop itself is also a combination of road surfaces and speed limits. At 17-kilometres long it runs on gravel, secondary paved road and highway. Speed limits vary from 50 to 80 km/h and the road climbs and drops off an escarpment – like ridgeline several times; plus it crosses the Head River twice at its lowest elevation. The off-road part of our testing is done on my own course at IronWood. Vans are not tested on the off-road though it’s noteworthy that the Mercedes Sprinter was equipped with a four-wheel drive system this year. This is the third year that we have used the data collection system and released the final fuel consumption report that MyCarma prepares for the Truck King Challenge. It’s become one of our most anticipated results. These vehicles are each all-new – or have significant changes made to them. However this year the Truck King Challenge decided to try something else new – by offering a returning champion category. This idea had been growing for a while having everything to do with the engineering cycles that each manufacturer follows. Simply put, trucks are not significantly updated each year and to date we have only included “new” iron in each year’s competition. However, we started to think that just because a truck is in the second or third year of its current generational life shouldn’t make it non-competitive. Certainly, if you watch the builders’ ads it doesn’t! So, this spring we decided that for the first time the immediate previous year’s winner (in each category) would be offered the chance to send its current truck back to IronWood to compete against what’s new on the market. This year the invitation was sent to the Ram 1500 EcoDiesel, Ford Transit 250 and Nissan NV200 – all previous winners that accepted the offer to return and fight for their crowns. They, along with the new vehicles, took the tests over two days with the judges evaluating everything from towing feel to interior features. The judges score each vehicle in 20 different categories; these scores are then averaged across the field of judges and converted to a score out of 100. Finally the “as tested” price of each vehicle is also weighted against the average (adding or subtracting points) for the final outcome. The overall top scoring 2016 Canadian Truck King Challenge winner is the Ram 1500, Laramie, 3L EcoDiesel, V6, diesel, 8-speed Auto. Congratulations to all the winners and to the two repeating champions – the Ram 1500 EcoDiesel and the Ford Transit 250.